We deserve to quit our jobs and travel. That’s right. For better or worse, irregardless of whether we’re bankers, lawyers, or even a strapped-for-cash marketing associate who didn’t even go to private school, we all possess the right, in our 20s, to just leave responsibilities behind and indulge wanderlust for a few years. So why not actually enjoy that right?! In 10 years, are you going to care if your career is “challenging," or “existent”? Here’s the way I see it, you guys. In between the ages of 20 and 30, nothing matters. It’s not real life. Cell phone bills, health insurance, politics... these are things our parents need to worry about. Someday, we will, too. But right now? Right now, when you hear the siren song of the open road calling your name, you answer it. I bet you’ve seen the movie Eat Pray Love. So, so inspiring. But here’s something you probably didn’t know about it that just might make your head spin: before it was a movie, it was actually a book. This is my case and point. Think about it: you’re basically not allowed to write a book unless it’s full of meaningful & good ideas, because publishing is expensive. So basically, abandoning your familial obligations and financial responsibilities is what we’re supposed to do to find food, spirituality, and Javier Bardem. Except unlike Eat Pray Love, we’re meant to do it in our 20s, before we become wide-mouthed crones like Julia Roberts. We wouldn’t even look good in selfies with Angkor Wat in the background if we wait that long, and at that point, why even bother? 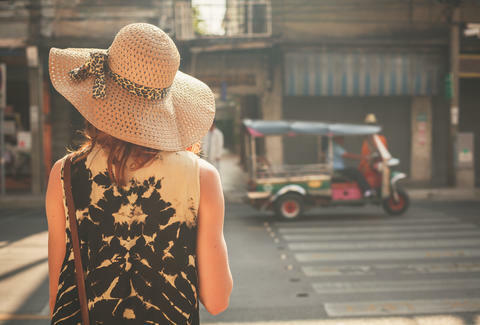 Moving on, traveling in your 20s is just better than working a stupid job. I mean, are we really going to care in 10 years whether our career is “challenging,” “on-track,” or “existent”? Or are we going to be glad we said “screw it” and used our leftover college money to book a party yacht in the Adriatic with 15 other kids from the frat? If there’s one thing I’m sure of, it’s that your 20s are when you really figure out who you are. Like, as a person. College is over: now it’s time to really find your True Self. You’re never going to learn, grow, and develop sitting in a cubicle, or even in an open-floor-plan office, which I guess are more popular these days anyway. Sure, your workplace offers you unlimited sick days, a dog-friendly environment, and the stability of a regular paycheck, things hundreds of thousands of unemployed Americans can barely imagine, much less achieve. But being forced to master new skills, collaborate with your peers, and overcome challenges creatively won’t enable the same sort of self-discovery as ziplining through the Costa Rican rainforest with your best friends (who are also in their 20s). That’s just common knowledge. Tom Petty once said this really smart quote that I saw on @UberFacts the other day. “The work never ends, but college does.” I’d like to amend that statement. The work never ends... but your 20s do. And I, for one, just won’t back down. I’ll stand my ground. Unless that ground is the floor inside the office of the job I quit to go smoke hash in Morocco. In that case, I just think I could really be growing more if I wasn’t tied down right now. Dave Infante is a senior writer for Thrillist. Well, he was, until he quit his job to travel. Follow @dinfontay on Twitter, Instagram, and Facebook.